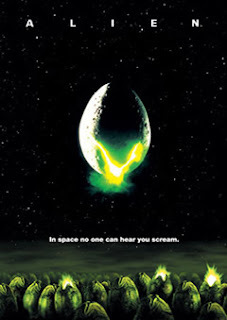 Tag line: "In Space No One Can Hear You Scream"
Widely regarded as a classic of both the horror and sci-fi genres, Alien is an incredibly dark film, with director Ridley Scott weaving an atmosphere of dread that proves to be all-consuming. After spending months in the outer reaches of space, the company-owned mining barge the Nostromo is finally on its way back to earth. Long before arriving home, however, the crew, which includes Captain Dallas (Tom Skerritt); Warrant Officer Ripley (Sigourney Weaver); Navigator Lambert (Veronica Cartwright); Executive Officer Kane (John Huirt); Science Officer Ash (Ian Holm); and engineers Parker (Yaphet Kotto) and Brett (Harry Dean Stanton, is awakened from its hibernation by the ship’s computer (nicknamed "Mother", and voiced by Helen Horton), which has picked up a distress call emanating from a nearby planet. Determined to investigate the signal, Dallas leaves Ripley in command and leads a rescue team to the surface. Once there, he and the others discover an abandoned ship that crash-landed many years earlier, and is now home to hundreds of strange, plant-like pods. Before they can figure out what these pods are, however, one of them opens up and unleashes a creature that attaches itself to Kane. Kane is immediately taken back to the ship, where Ash attempts to save him from the unknown intruder. But the damage has been done, and soon a deadly monster will be loose on the Nostromo, threatening the lives of all on board. Yes, Alien is well acted; Sigourney Weaver is impressive in her star-making turn as Ripley, the rugged second-in-command who plays everything by the book (a trait that doesn't exactly endear her to the rest of the crew); and both Kotto and Stanton deliver a few laughs as the gruff engineers demanding a bigger share of the profits. Yes, the special effects in Alien are magnificent; along with the now-famous scene set in the mess hall, when Kane and the others finally realize what it is they're up against (easily the most shocking sequence in the entire film), the creature itself, designed by H.R. Giger and revealed ever so slowly throughout the film by director Scott, is pretty damn alarming. Yet as strong as these aspects are, what stayed with me long after Alien ended was its dark, brooding atmosphere, enhanced at all times by the movie's central location: the crumbling Nostromo spacecraft, which, with its narrow corridors and dark passageways, is downright claustrophobic. This, combined with a general feeling of isolation that gradually settles over everyone on board, reminds us that the Nostromo, aside from falling apart, is too far from earth to call for help. Scott sets the perfect mood right at the outset, taking us on a tour of the ship before the computer awakens its crew, the ominous score of Jerry Goldsmith, occasionally interrupted by the clanking of machinery, cluing us in that the Nostromo won’t be anything like the pristine spaceships found in 2001: A Space Odyssey. In fact, as we'll soon discover, this is the last place you want to be when a carnivorous alien is on the loose! As frightening as the central creature is in Alien, it is doubly scary lurking around on the Nostromo. Not only did the film introduce us to one of the cinema’s most memorable monsters, but it also put it on a ship that itself managed to give us the creeps. I like this film a lot, and you've mentioned the reason why. The film works in large part because of the set. Alien is really nothing more than a haunted house in space, but the set channels and limits the characters in specific ways, all of which heighten the tension. As you mentioned Dave this is both a scifi and a horror classic. Don't see that very often. @SJHoneywell: You nailed it! Without the Nostromo, ALIEN would have been an above-average horror film. Set on that creepy ship, however, it's a masterpiece of thrills and chills. @Kevin: You certainly don't see it often. ALIEN and THE THING are the two that leap to mind. I'm sure there are others I'm not thinking about right now, but I don't believe there are many that reach the "classic" category. @Anthony: I did see PROMETHEUS, and while I liked it more than some, I will admit there are weaknesses (I actually cringed when Theron uttered "FATHER"!). And you're correct: the opening scene to this movie really establishes the character's relationships to one another in a brilliant way, and let's us know what we're in for. No, it sure isn't STAR TREK! @Anthony: Yeah, that's definitely another cringe moment! And thanks for sharing the link. As always, great review! The other great horror-scifi hybrid that leaps to my mind is "Invasion of the Body Snatchers". This movie also obviously owes a lot to "It - The Terror From Beyond Space". @Dean: yes! INVASION OF THE BODYSNATCHERS is definitely a classic! Ironically enough, the makers of IT! THE TERROR FROM BEYOND SPACE considered suing the studio behind ALIEN for stealing their concept!